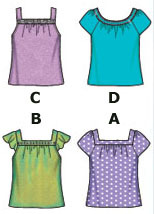 Simplicity 4589 -Scooped or squared neckline tops in 6 views which pullover (no zipper in any view) and call for lightweight fabric such as laundered cotton, challis, crepe back satin, jacquared, laundered silk, rayon, gauze, double georgette, soft lightweight linen and linen blends. I chose view A, size 14 to make a muslin. This view is really the same as view B (slighly different sleeve) and view C (which is sleeveless). They all use the same bodice and neckline pieces, but A and B throw on a sleeve, of course. My modified version has no sleeves. Yes, the first top looked as they intended, the second top is modified (see below). I will say the bodice pieces are cut generously and they really have you do some gathering on the upper edges of the front and back sections. I didn’t want that much poofyness on my first top so I cut on the fold after moving the pattern off the fold about 3/4″ and that worked out great for me. So, it is as the pattern intended but not as poofy. 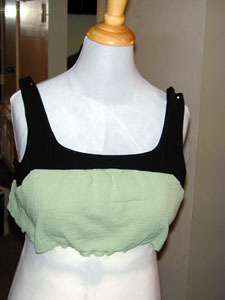 Original top is gauze from Joann. Modified top is black poly non-stretch for the neck, banding and ties; the bodice is gauze. I plan to make this again using a knit so I felt it would give me the closest outcome if I used gauze for my first modified run. 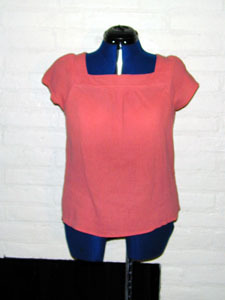 As for the modified version, I decided I am bonkers for the square-ish neckline as it gave me a great starting point to work toward copying a really cute RTW top I saw online. I don’t know why (FBA sickness?) but I did a full bust adjustment on it the first time out of the package and that dart is sewn. On the modified top, I smooshed out the side dart after retracing over the original tracing. I somehow calculated and drew the modified top banding and upper bodice just right on the first try. Yay! What a victory! 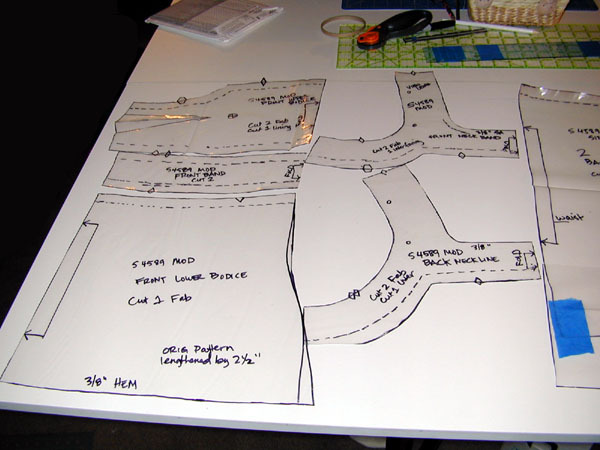 I traced over the top of my original tracing and added seam allowances. It was slow going as I was both extending the shoulder strap length (to bring it lower down my chest and back), widening it across my chest slightly then wrapping under the arm in one piece. The front bodice was further redrafted to preserve the fullness over the bust but allow for the banding under the arm. 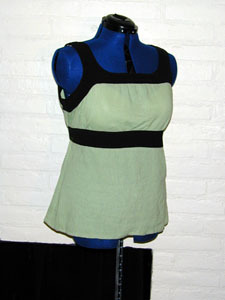 The bottom bodice was extended 2.5” in length. 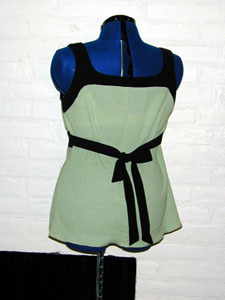 I also added ties like the RTW top, although I miscalculated and should have cut them wider. Next time! I am delighted that all the deliberation and debating with myself paid off… I pondered it for too long before diving in and doing it. The bottom of the bodice was problematic for me. It took two tries before I finally got a look over my tummy that wasn’t reminiscent of my pregnancy days. That was the tough part (surprisingly) since I thought modifying the neckline and upper bodice was going to make it or break it. Then I had to redo the back as it was too short and found I wasn’t able to cut it on the fold. The RTW version has a center back seam but I was hoping to avoid it. Oh, well. I am sewing a black based wardrobe next and this is on the roster. 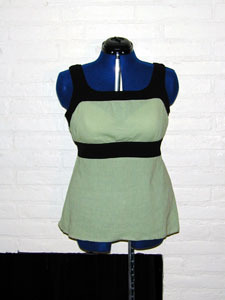 I also found a version on Anthropologie’s site that uses elastic under the bust. They have two versions, one is knit and one is woven. Interesting! I might give the elastic a try as well. Just not the most attractive pattern envelope, is it? But I say give it a shot, you never know if it will agree with you or not. I’m loving it! I love the changes you made to this top – that contrast band really looks sharp. The modified version is fantastic. I love it. I bet it looks great on you! Really cute. Thanks for all the detail. Your modified version is really cute! Your modified top is cute. I’ve got a question for you. Every book that explains fba has a dart in the original pattern. The pattern you used doesn’t seem to have one. I want to make Simplicity 3750 but I need to do a fba. This pattern doesn’t have darts. Can you recommend a book, article, or website that explains fba on a pattern without darts? Thanks so much. Hi Carla, I highly recommend the book, “Fit For Real People” to you. No side dart: create it by doing a FBA as if there was a dart to begin with by drawing a line through the middle of an imaginary horizontal dart and go from there as usual. Hope that helps! That top looks absolutely great and very-very trendy! With the changes you made, it’s so much better than the original pattern. I LOVE the modified top! I have to admit, I am guilty of wearing the pink top maybe a little bit too often *shhhhh, don’t tell* It is sooo comfy 🙂 I should sew it again but haven’t decided on a fabric yet.